She Leads Africa Launches SLAY Festival For The 21st Of January and KAMDORA Has 2 Tickets To Give Away! Here’s Your Chance To Win. 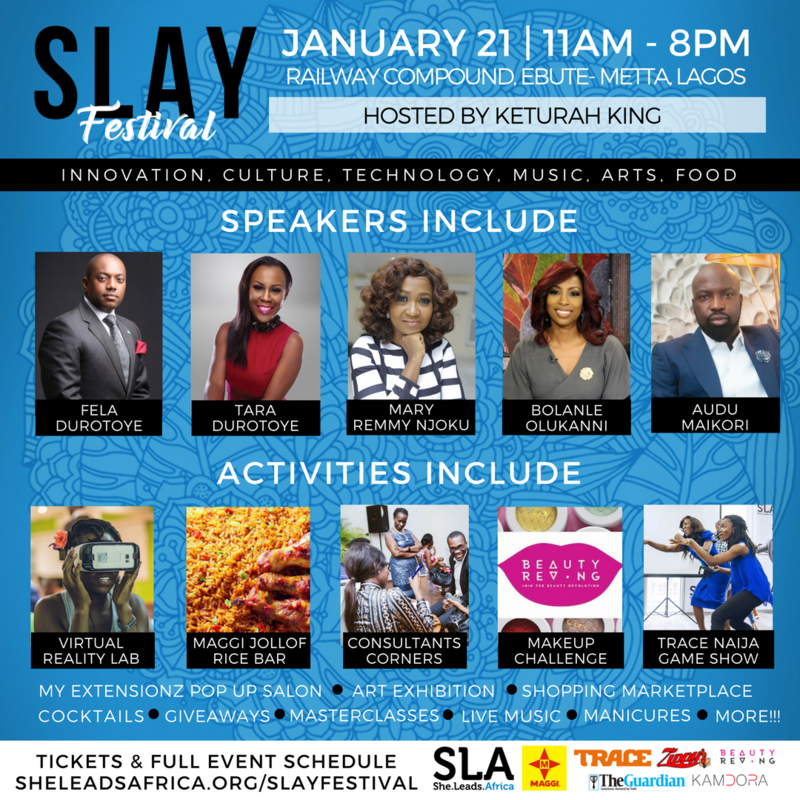 Digital media company She Leads Africa has announced the launch of the SLAY Festival, an outdoor celebration of innovation, culture and technology with African women at the center. Set for January 21, 2017 from 11am – 8pm at the Railway Corporation in Ebute-Metta, Lagos, the festival will feature inspirational speakers, virtual reality lab and exhibition, consultants corner for free business advice, a marketplace with women entrepreneurs, and much more. Tickets are only N3,000 if purchased in advance and are available at SheLeadsAfrica.org/SLAYFestival. Media partners for SLAY Festival are Kamdora, TRACE Naija, Bella Naija and Guardian. Event partners are Maggi Nigeria and Zippy Logistics. For a chance to win a ticket to what promises to be an amazing experience, see the image below. Who knows, we just might choose you! Individuals interested in learning more about these opportunities and joining the She Leads Africa community can join here. Interview requests can be sent to press@sheleadsafrica.org. Ankara Styles #250: It’s The Super Woman!